Give the gift of good taste to your loved ones and corporate clients this Hari Raya with festive hampers and cakes from Lemon Garden 2Go at Shangri-La Hotel, Kuala Lumpur. There are two types of Hari Raya hampers available at Lemon Garden 2Go. 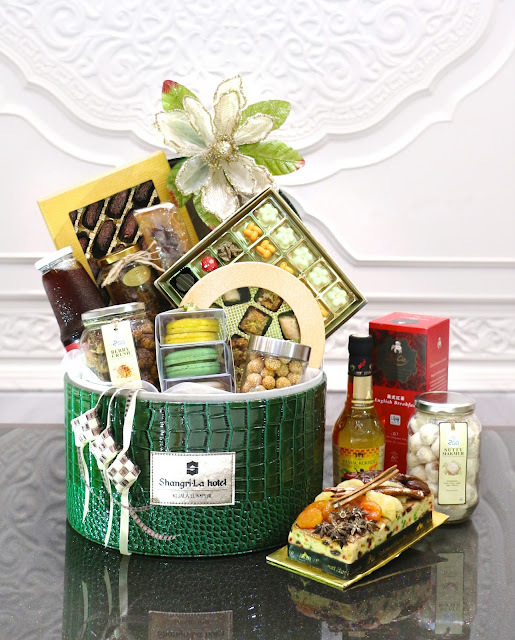 The premium hamper, priced at RM 988nett consists of a 500g Hari Raya cake, homemade chocolate pralines, apple vinegar, premium tea and dates, beef ‘serunding’, baklavas, fruit jam, crunchy cookies, assorted nuts, ‘dodol’, ‘pandan’ layer cake, macarons and pomegranate juice. The deluxe hamper, priced at RM 688nett includes a 500g Hari Raya Cake, homemade chocolate pralines, apple vinegar, premium tea and dates, ‘ketupat’ cookies, ‘dodol’, macarons and assorted nuts. A selection of three Hari Raya designer cakes are also available to be purchased. The 1 kg cake is priced at RM 150 nett, the 3kg cake is priced at RM 280 nett and the 5kg cake is priced at RM 480 nett. The other festive items available are fruit cakes, layer cakes in ‘pandan’, mocha, durian and traditional flavours, designer cookies, cupcakes and more. The price for these treats range from RM 12 for a box of designer cupcakes to RM 100 for a box of homemade macarons. The Hari Raya hampers and goodies are available from 27 May to 24 June 2017. To purchase these lovely festive treats, drop by Lemon Garden 2Go at the Lobby Level or call 03-2074 3546.